Synthetic Armor™ Pads protect slings from abrasion damage that can be caused by contact with rough surfaces such as concrete beams and structures. They are also used to protect finished or painted loads from marring. These pads can be made to fit any length or width sling. They can also be made in long lengths that the customer can cut into suitable sizes on the job. Double or triple thickness provides resistance for more severe conditions. A variety of materials is used to protect slings and loads depending on the degree of abrasion expected in the application. DO NOT USE this Pad to protect sling from cutting on load edges, corners or protrusions. This pad WILL NOT adequately prevent damage or failure of sling if used for cut protection. Only Pads which are tested and rated for cut protection are to be used to protect sling from cutting. DEATH or INJURY can occur from improper use or maintenance. Sling users shall be trained. Shackle Pin Pad The pin area of a shackle can damage synthetic slings. Placing synthetic slings on the pin should be avoided. Shackles have a sharp edge where the pin goes through the shackle ear. If the sling is rigged on this area, it can become severely damaged. If you must rig on the pin, protect your sling with a Shackle Pin Pad. The Shackle Pin Pad is sized for the model of shackle and protects the sling along the entire pin. 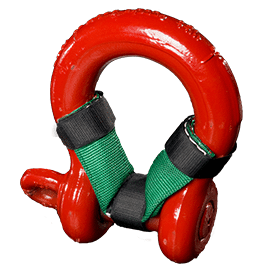 Can cause damage or failure of sling if misused or damaged. Inspect before each use. Inspect for cuts, tears or damage that may prevent protection of the sling. Be sure abrasion protection is the correct size and type to protect the sling. DEATH or INJURY can occur from improper use or maintenance.